Free Second-Day shipping upgrade + 20% off DVDs, CDs and apparel! Get your DCI gifts underneath the Christmas tree in time! Christmas is coming soon, but it's still not too late to ship in time for December 25. 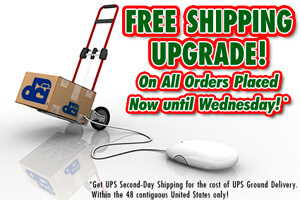 For the cost of UPS Ground, we'll upgrade your shipment to UPS Second-Day delivery for free*! That means when you place your order before 12 p.m. ET on Wednesday, Dec. 22, you'll still be able to get those special drum corps gifts in time. *Shipping upgrade is limited to delivery within the Continental U.S. excluding APO/FPO addresses. Entire order must ship to a single address. Does not apply to prior purchases or open orders. Customer is responsible for shipping costs on returned merchandise. Offer ends Wednesday, Dec. 22, 2010 at 12 p.m. ET. **20% off promo code is not valid for 2010 World Championship Blu-ray or Blu-ray bundles. Does not apply to prior purchases or open orders. Offer ends Sunday, Jan. 2, 2010 at 11:59 p.m. ET. Promotions may be modified or terminated at any time. Certain restrictions may apply.